A book by Pierre Lidiaux about the urbanistic evolution of Brussels Published in 1960 AD, most of the copies have mysteriously disappeared, and the work is now so difficult to find that many boubt its very existence. 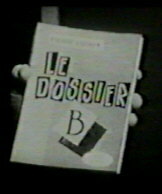 A documentary produced for Belgian television in 1995 AD by Wlber Leguebe 1). The Brüsel Boutique sponsored the making of 1000 video copies in 1999.